Not many starting pitchers in Major League Baseball can be successful while throwing just two pitches. Pitchers usually face a batter two or three times throughout a game, and if the batter has to guess from just two pitches, odds are he’s going to have a favorable outcome. Hall of Famer Greg Maddux is one of the few successful two-pitch pitchers, but he’s the definition of an outlier. He relied heavily on an elite sinker and devastating changeup, and ended up being one of the game’s best thanks to his knack for forcing ground balls. You’ll be hard-pressed to find another two-pitch pitcher who can do that. That’s what Taylor Jungmann is trying to do, though, as he is solely throwing a four-seam fastball and a curveball thus far in 2016. Yet, the results haven’t been favorable. In fact, they’ve been downright poor. Through three starts, Jungmann has a 9.00 ERA, 4.88 FIP and 4.39 xFIP. He’s striking out just six per nine and is allowing a .357 batting average on balls in play, which, by the way, is the 12th-highest mark in the majors. Usually I would say that high of a BABIP isn’t sustainable, but Jungmann’s pitches are getting crushed at such a high velocity, I’m not so sure we’re going to see much of a dip. According to Baseball Savant, Jungmann has allowed an average exit velocity of 93.98 mph; only 10 other pitchers have been hit harder (min. 100 pitches). Oddly enough, two of those pitchers are also Brewers in Wily Peralta (95.64 mph) and Jimmy Nelson (94.83 mph). Maybe it’s a Milwaukee thing. Clearly, hitters aren’t being fooled by what Jungmann has to offer, partly because neither of his two pitches are considered dominant. That’s showcased by his numbers. As you can see from the chart, Jungmann loves throwing his fastball, while mixing in his curveball about 31% of the time. Brooks Baseball says he’s thrown three changeups, but that could just be a classification error. Jungmann has just eight strikeouts on the year, 75% of those coming via is curveball. His curveball has actually been somewhat successful; it’s his heater that batters are demolishing. Just look at Jungmann’s BABIP and isolated slugging. It’s sky high. The reason his curveball has limited hitters to a .211 batting average can be explained by the fact that hitters are simply expecting his fastball. Wouldn’t you be if you knew your pitching opponent threw it at a 66.8% clip with only one other pitch option? Of course you would. Throwing just two pitches is new for Jungmann. He didn’t do it in 2015, and as far as I can tell, he didn’t do it in the minor leagues. Last season Jungmann used a bigger arsenal of weapons. A year ago he had a changeup and sinker. Where have they disappeared to in 2016? And why? It’s not like they were ineffective pitches. On the contrary, actually. 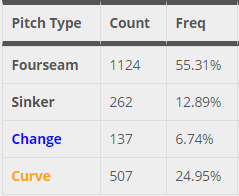 Jungmann allowed a .244 batting average against his sinker, and a lowly .143 average versus his change. And in case you forgot, Jungmann had a wonderful rookie season, posting a 3.77 ERA and 3.92 FIP. Why he chose to abandon two pitches that worked for him is a question that deserves an answer. Did new pitching coach Derek Johnson make that call? Was Jungmann uncomfortable throwing those pitches? Before we all start freaking out, though, we must realize it’s only April and Jungmann has only pitched 13 innings. Maybe the right time to throw his sinker or changeup hasn’t occurred yet. That seems likely seeing as how Jungmann threw those two pitches just 18% of the time last year. But nonetheless, Jungmann’s season hasn’t started according to plan. His strikeouts are down, his walks are up and his fastball is being served on a silver platter. He needs to either start mixing up his pitches like an actual major league starting pitcher, or hope his fastball and curveball magically become Aroldis Chapman– and Clayton Kershaw-esque. This entry was posted in Pitch Usage and tagged Milwaukee Brewers, Taylor Jungmann on April 19, 2016 by Justin Schultz. Warning: Below is the same opening I used for my hitter projections (lazy is my name), so feel free to skip it and scroll down to the projections. It’s that time of year again, when projections are being unleashed and the biased trolls of the internet emerge from their caves. I love it. People say that projections are like throwing darts at a dart board and hoping it sticks where you want it too. Well, if that’s the case, then the dart’s trajectory has been calculated countless of times and the dart board is bigger than the average one. Projection systems, like Steamer and ZiPS, are the most accurate darts we currently have at our disposable. So many components (i.e. park factors, age, injury history, talent) play into their forecasts that it’s asinine not to put at least a little merit in them. With that being said, my projections are not based on a mathematical model. My brain doesn’t possess the functionality it requires to build one or to even interpret simple mathematical equations. For someone who is so invested in sabermetrics, I don’t know a lick of math. I guess my projections are simply predictions. On the other hand, my projections are more than just guess work. I’ve poured over each player’s statistical history, taken injuries and age into account, looked at splits, went over other projection systems and basically every other thing I could possibly do to make sure my projections were well-informed. The rotation should be considerably better than a year ago. No Kyle Lohse, and there’s no way Matt Garza can repeat his outrageously horrendous performance, is there? Jeremy Jeffress is primed for another fantastic season, especially if he can up his K rate. Jimmy Nelson will have the highest WAR and solidify his spot as the best pitcher in the rotation. Wily Peralta’s strikeout percentage will continue to be underwhelming. The bullpen might struggle, especially if the starters can’t go deep into games. This entry was posted in Projections and tagged Milwaukee Brewers, Projections on April 4, 2016 by Justin Schultz. No Brewer will bat .300 or better, and only four will be above-average hitters. I expect Jonathan Lucroy to bounce back and re-enter the “best catcher in baseball” discussion. I’m excited about Chris Carter. I wouldn’t be surprised if he put up 40 home runs. According exit velocity, nobody hit the ball harder than Carter from Aug. 1 on in 2015. His defense will keep his WAR down. Domingo Santana, the most exciting player on the roster, will be an All Star this season. Mark it down. Milwaukee’s bench is a sight for sore eyes. In a strange and rather wild move, the Milwaukee Brewers have acquired Prince Fielder from the Texas Rangers in exchange for Jimmy Nelson, Matt Garza and Tyrone Taylor. Fielder returns to the organization that drafted him and for which he played from 2005 to 2011. Nelson was slated to be Milwaukee’s No. 2 starter in 2016 with Garza slated right behind him, but General Manager David Stearns says Zach Davies and Michael Blazek will get the first crack at the rotation spots. Taylor, once considered one of the organization’s top outfield prospects, is also headed to Texas. Fielder hit 23 home runs and was worth 1.6 WAR for the Rangers last season. Stearns also isn’t listening to the criticism surrounding the move. Incumbent first baseman Chris Carter will be moved to center field, according to manager Craig Counsell, despite having zero experience in the outfield. This most likely means Keon Broxton and Kirk Nieuwenhuis will not make the team. When told about the trade, Fielder didn’t mince his words. Fielder’s agent, Scott Boras, declined to comment, but a source inside the Commissioner’s Office says he is actively trying to get Rob Manfred to negate the trade. It was already going to be a lousy season in Milwaukee, but this trade takes it to even greater depths. Happy April Fool’s Day, everyone. Ruin someone’s day by sharing this. This entry was posted in Trade Talk, Uncategorized and tagged Jimmy Nelson, Matt Garza, Milwaukee Brewers, Prince Fielder, Texas Rangers, Tyrone Taylor on April 1, 2016 by Justin Schultz.